How hard is it to regularly have a fresh, healthy, yummy, affordable, yet quick lunch at work? (Yes, I’m including housework and child-rearing here!) I for one am heavily reliant upon home-made dinner leftovers but they score a bit low on the freshness scale. What if I had one of these on the office desk (or kitchen bench)? Our family is about to begin trialling this concept at work… two self-watering planters, one in active service at the office and a spare in the nursery stage, to be swapped over every few weeks. 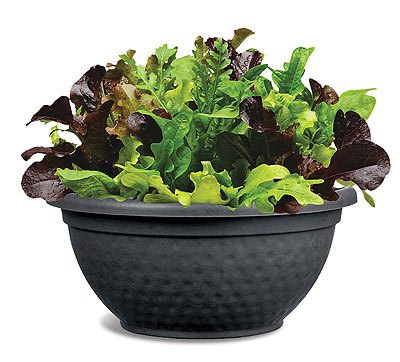 This should supply fresh organic mixed salad leaves for sandwiches or salads at a rate of 3 meals per week for about three weeks before a swap is required. The trick is to pick just a few outside leaves at a time from each plant as they keep growing from their centre. I’ll report back on our little experiment in a few months. Meanwhile if you’d like to try out the office salad bowl too, let me know and I’d be happy to make some for you… $15 each for the first three orders (full price $20)… refill/swap $15. Waiting time approx. 6 weeks for the first round. All plants grown from seed supplied by Greenpatch Organic Seeds and fed with home-made worm goodness. ORDERS: Ph. 0410 636 857. Email nadjasgarden@gmail.com. This entry was posted in food storage, special offers, time management, vegetables. Bookmark the permalink.